The Shopbop VIP sale is officially live! This is my favorite sale of the year ( yes, over Nordstrom…gasp!) I have rounded up all of my favorites included in the sale and even some splurge worthy purchases. 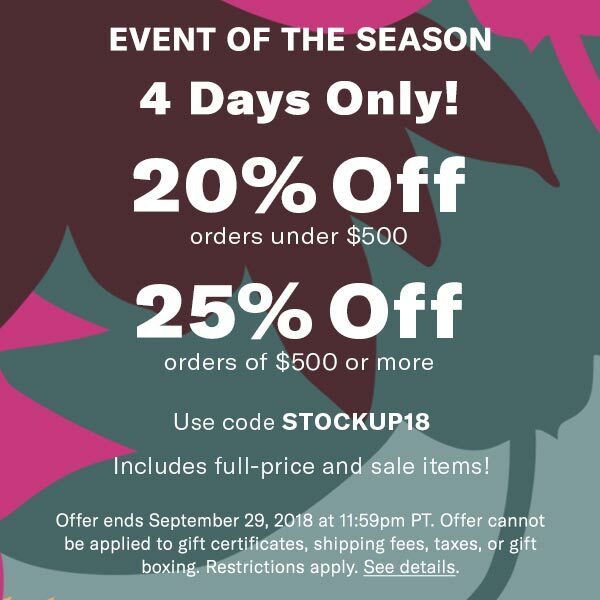 With code STOCKUP18 you will get up to 25% off your entire purchase. New arrivals and sale items included! I am honestly so excited the Stuart Weitzman Lowland boots are included in this sale. These over the knee boots are the best and will last you for years! One thing I know I use on a daily basis are sunglasses and my card wallet. I always hated carrying around a wallet, but card wallets will fit in any purse or even my jean pocket! Also, if you don’t wear sunglasses then…I just don’t know. I have about 3 pairs near me at all times! These are two brands of sneakers I have had my eye on FOREVER. Golden Goose Sneakers are more of a splurge and much more trendy and then APL come in so many incredible colors. I have heard that APL sneakers feel like a cloud and are perfect for training. I have been wearing my Chloe look saddle bag purse for over a year now and I have worn it so much I am seriously considering buying the real deal. These saddle bags are all so beautiful and did you know that Chloe has a sister brand called See by Chloe? I am obsessed with SO many pieces! Here are some pieces I have added to my cart. All of these are items I know I will get tons of use out of, but Michael would kill me if I actually bought everything sooooo which pieces would you choose? I need to narrow it down before I hit purchase. HA! Are you shopping the Shopbop VIP sale? Let me know which pieces are your favorites and which pieces you think I should buy. PS I am giving away some goods on my Instagram weekly to anyone who engages with my photos. All you have to do is consistently like and comment on my photos and you are entered!